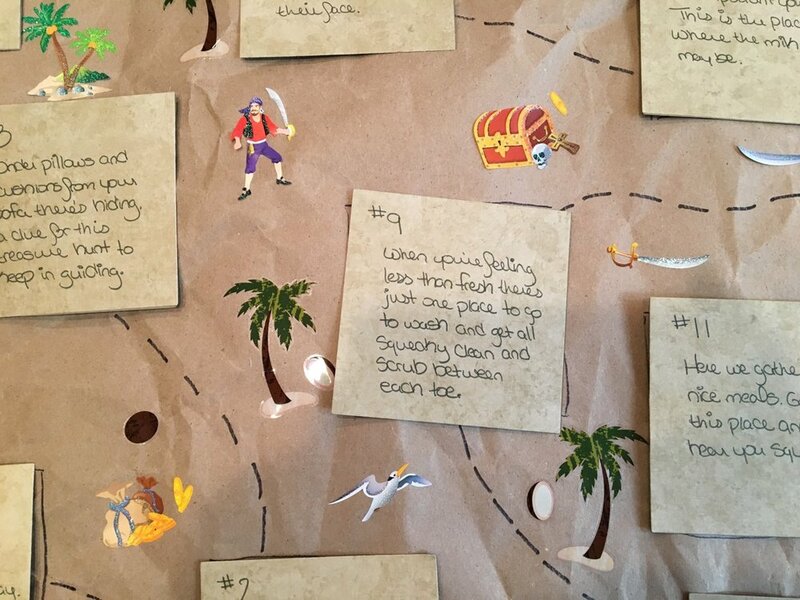 Our big activity at the birthday party is a pirate treasure hunt. I started with a large piece of kraft paper. I created a path at random knowing I had 12 clues for the kiddos. Arthur picked out some pirate themed stickers to use in decorating our map. The squares are where the clues will be attached as they are found. I went with simple little riddle rhymes. In case the kids don't get it, I also printed out images of where to find the next clue. And at the end of the path, the treasure chest is waiting with coins (plastic and chocolate) and jewels (beads, plastic, and ring pops).